David Pozzi's First Gen Suspension page is also a great resource for 67-69 Camaro chassis information. Though it is not focused on originality, it contains a lot of pertinent information. All 6-cylinder cars for all 3 years came with monoleaf springs (see the brake system information below for the possible -- but very unlikely -- 1969 JL8 4-wheel disc brake exception). All 1967 models used monoleaf design rear springs. For 1968, only models with the 12-bolt rear end received multi-leaf springs. This included all SS models, the Z28, and the L30/M20 327/275hp 4-speed. All other 1968 models used monoleaf springs. In 1969, all models with 12-bolt axles received multi-leaf springs and all models with 350ci engines (10- or 12-bolt) received multi-leaf springs. Vehicles with 307 and 327 engines received mono-leaf springs. All 68-69 Z28's used 4-leaf springs. Generally, the other multi-leaf spring applications used 5-leaf springs. However, the use of 4-leaf springs was not limited to just 68-69 Z28's. Spring selection was a function of weight and options - and this was fine-tuned in 1969. 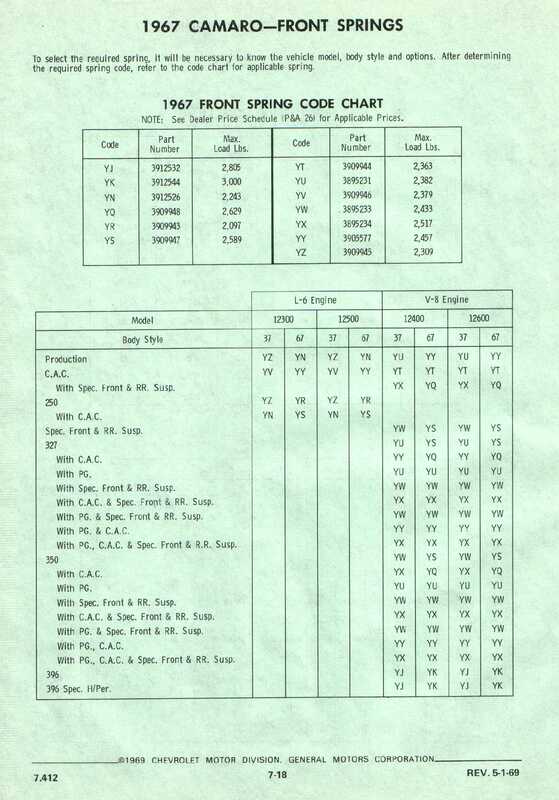 SS, LM1, L65, and COPO cars with 4-leaf springs are possible according to factory documentation and they have been observed on original SS, LM1, and L65 cars. The spring characteristics varied depending on the vehicle model, options / vehicle weight, and spring options (F41 and G31). Some of the spring part numbers and applications are shown in group 7 of the parts manuals and some are shown in the Assembly Instruction Manual (AIM). The vehicle ride heights are shown in the AIM. The 67 front spring table and the 67 application table, both from service parts manuals. 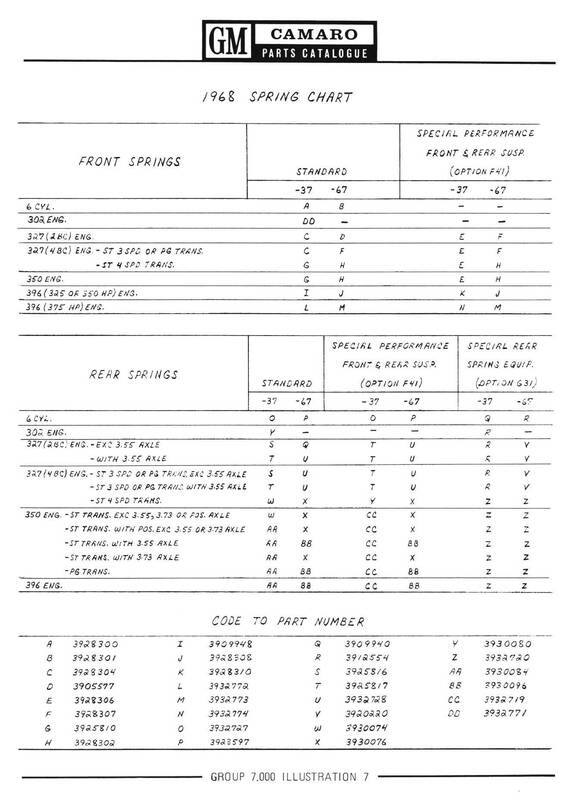 The 68 application table from a service parts manual. 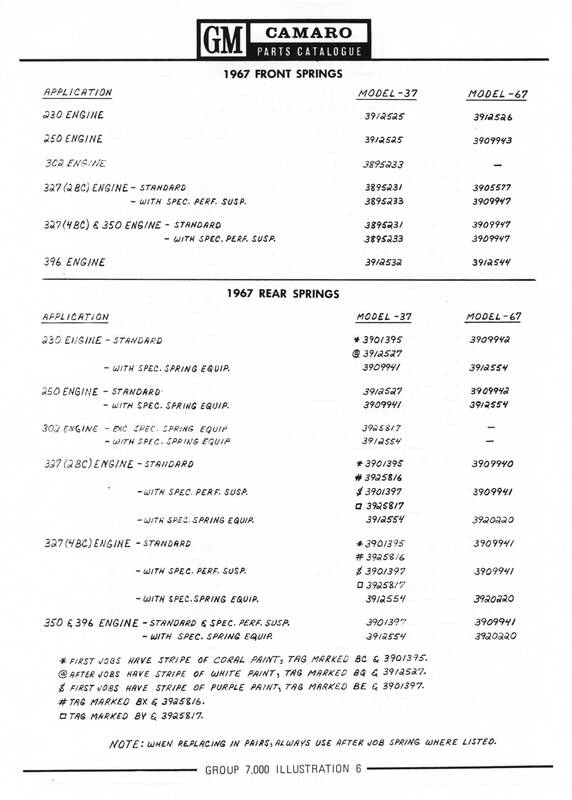 The 68 L30 & L48 spring table compiled from GM documentation and vehicle data. 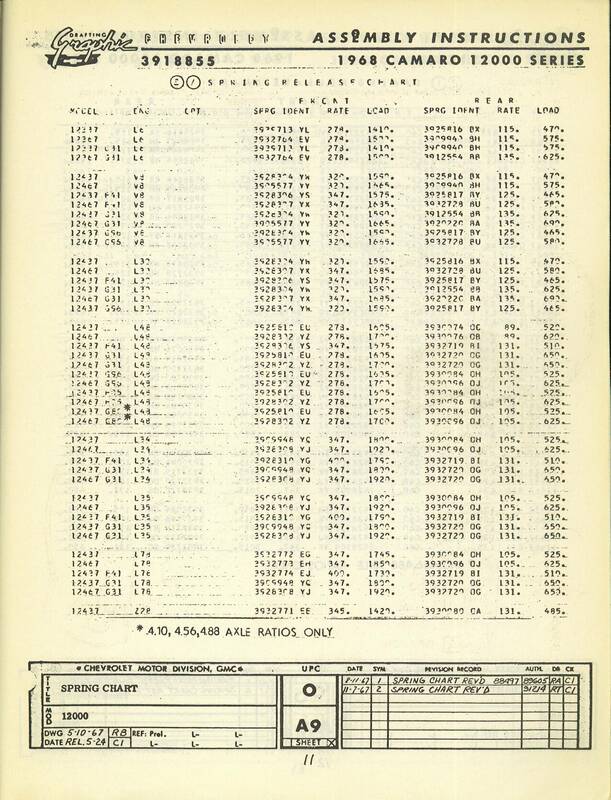 The original spring information from the 68 AIM: page 1, page 2, and page 3. The 69 spring chart from a service parts manual. 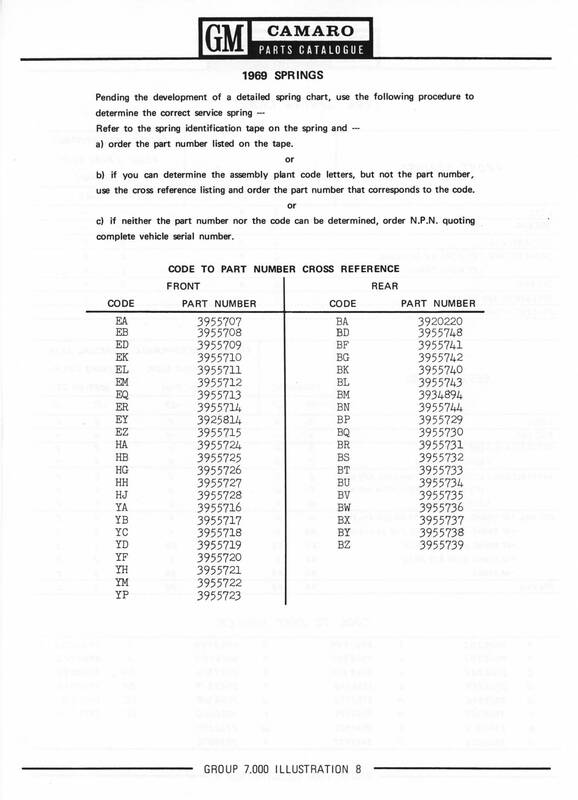 Note that Table A (illustration 15) has an incomplete listing of the spring part numbers (e.g. EL, EM, and EQ all have the same part number). The 69 spring ID table from an earlier service parts manual has the complete listing. As noted above, there are some difference between the service information versus production usage. Some springs with confirmed usage do not appear in any documentation and some springs part numbers and associated broadcast codes do not match the documentation. Also note that not all spring part numbers were sold as service parts and not all are reproduced. 12-bolt axles were installed on all SS350's (with the exception of 1969 SS350's with Powerglide transmissions, see note below), all SS396's, and all Z28's. 1967-68 L30/M20 cars from Feb 1967 through the end of the 1968 model year. 1969 cars with the LM1 engine. The 12 bolt axle was used with all manual transmissions and almost all automatic transmissions (a limited number of LM1 automatics have 10 bolt axles). Some 1969 cars with the L65 engine (which replaced the LM1 engine in January 69). Most L65 axles were 10 bolts, but some, especially near the start of L65 production, were 12 bolts. All models with the 1969 JL8 factory 4-wheel disc brake option. 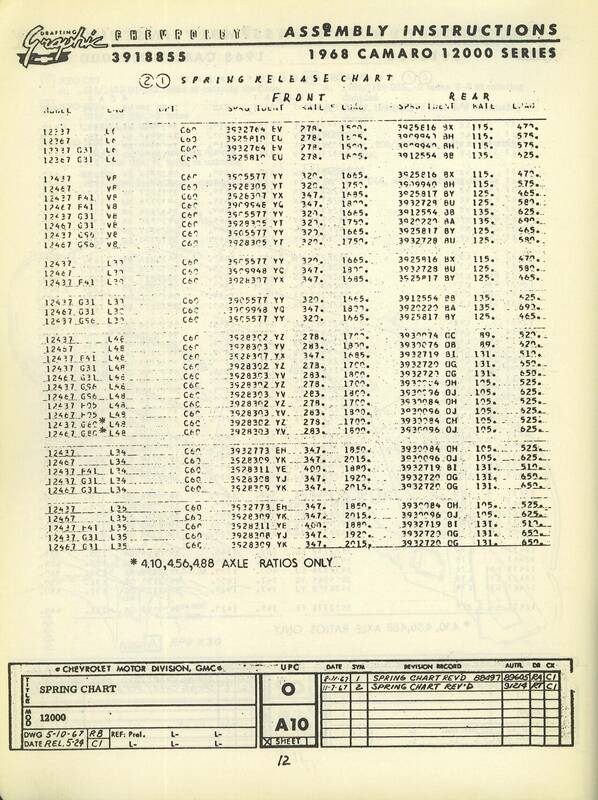 Most 1967 6-cylinder and 327 cars that were ordered with both positraction and axle ratios not commonly ordered in 10-bolt axle applications (2.73 and 3.55). The 2.73 ratio with positraction appears to have been only available with a 12-bolt axle in 1967, presumedly to reduce inventory. There is limited data on the 3.55 ratio axles, but it shows a mix of 10- and 12-bolt axle usage. Note: GM documentation indicates that 1969 SS350's and LM1's with automatic transmissions received a 10-bolt rear axle. Only SS350 cars with Powerglides have been observed to have 10-bolt axles. 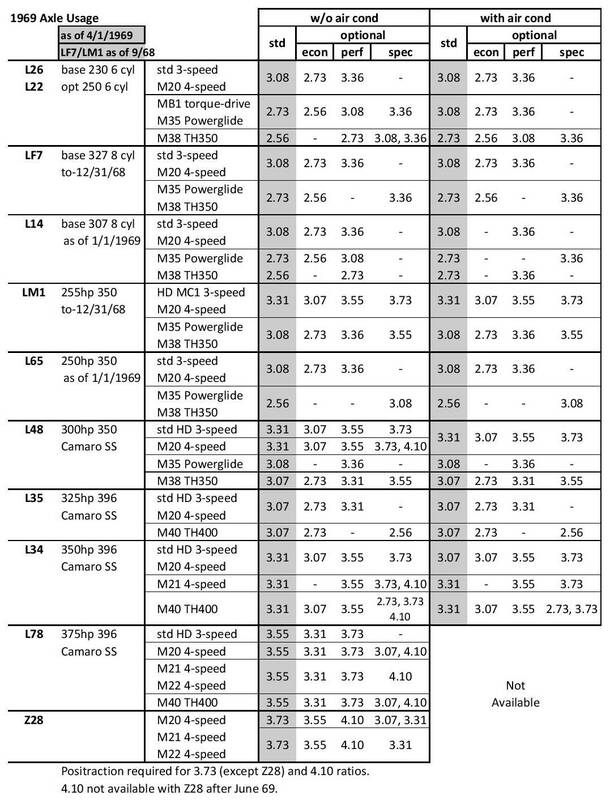 Some LM1 automatics have 10 bolt axles. Please contact us if you have a 1969 SS or LM1 car with a 10-bolt axle. Here are the tables that show the axle ratio usage by engine and transmission, also known as the Power Team Charts. These charts changed at least once or twice during the production year. What is shown is a snapshot in time - the April versions. A few powertrains may have had different ratios earlier in the year. A notable example is the 67 L30/M20 standard ratio was 3.08 10-bolt, then 3.07 12-bolt, then in April it changed to 3.31 12-bolt. The upper a-arms used for all 67-68 Camaros and 69 Camaros with drum brakes and JL8 four-wheel disc brakes were the same design. 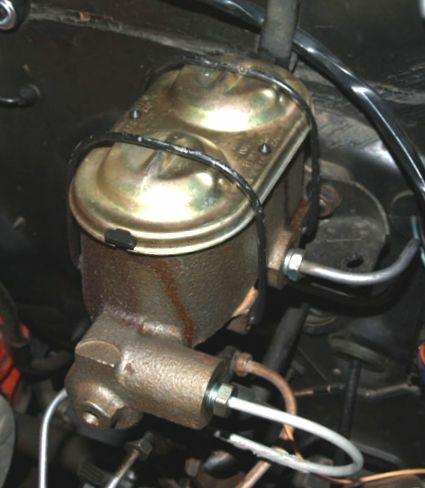 The 69 J52 disc brake cars used the same basic part, but there were two holes added to the trailing side of the a-arm for mounting a support for the brake hose. The lower a-arms used for the 1st-gen Camaros had small but noticeable differences for all three years. This was primarily due to changes in the location of the rubber bump stop which was used to cushion any contact with the frame upon full compression of the suspension. It is unknown why the location of the rubber bump stop changed each year. In 67, the rubber bump stop was mounted on a bracket which was welded to the frame, thus there is no rubber piece mounted on the lower a-arm and no holes drilled in the a-arm to do so. For 68, a newly designed larger rubber bump stop was mounted (through two drilled holes) on the trailing side of the a-arm. The mounting bracket for the rubber bump stop (which had been in-line with the centerline of the wheel in 67) was removed and a newly designed metal contact pad for the rubber bump stop was mounted on the trailing side of the coil spring pocket on the frame. For 69, the same rubber bump stop was moved to the leading edge of the lower a-arm and the corresponding metal contact pad on the frame followed suit to the leading side of the coil spring pocket. 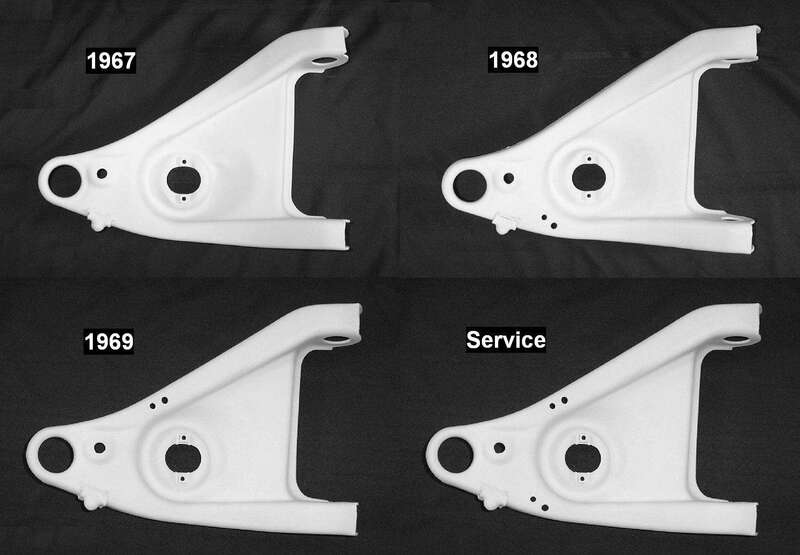 All service replacement a-arms included mounting holes for both the 68 and 69 positioning of the rubber bump stop. Obviously, these holes are not relevant for the 67 application since the rubber piece is on the frame. The 67 and 68 lower a-arms use welded-in nuts for the lower shock mount. For 69 and for all service replacement a-arms, the shock mounting nuts were attached by a J-clip, which simplified the nut installation and also allowed for easy replacement. The Assembly Instruction Manuals for all three years show different part numbers for the lower a-arm assembly for drum brakes and the lower a-arm assembly for disc brakes. Despite analysis of the parts, the difference is unknown; it may involve another component of the a-arm assembly. Manual drum brakes on all four wheels were standard for all models except Z28. The power assist option was RPO J50 and the front disc brake option was RPO J52. Power assist was not required with the front disc brakes. Power front disc brakes required both J50 and J52 options. While SS neither included nor required front disc brakes, the J50/J52 combination was a mandatory option for Z28. The disc calipers were a 4-piston design used only in 67 and 68. - The RPO J65 metallic drum brake option added metallic brake shoes on all 4 drums. J65 was supposedly only available on 67 SS's but it has been observed on a few non-SS cars. - The RPO J56 heavy duty disc brake option was only available on 67 Z28's and was in addition to the required J50 and J52 options. It consisted of heat insulators on the disc brake caliper pistons and metallic rear drum linings. Both RPO J65 and J56 used the same metallic rear drum linings (and thus used the same metallic brake rear axle assemblies). Manual drum brakes on all four wheels remained standard for all models except Z28 and mid-year SS396. RPO J50 power assist remained a separate option for drum brakes, but RPO J52 front disc brakes now included RPO J50, and thus all 1968 disc brakes were also power disc brakes. This was the last year for the 4-piston disc brake calipers. The disc brake emblem appeared on the brake pedal of disc brake equipped cars in the January / February 68 timeframe. Initially, SS models did not require any brake options. 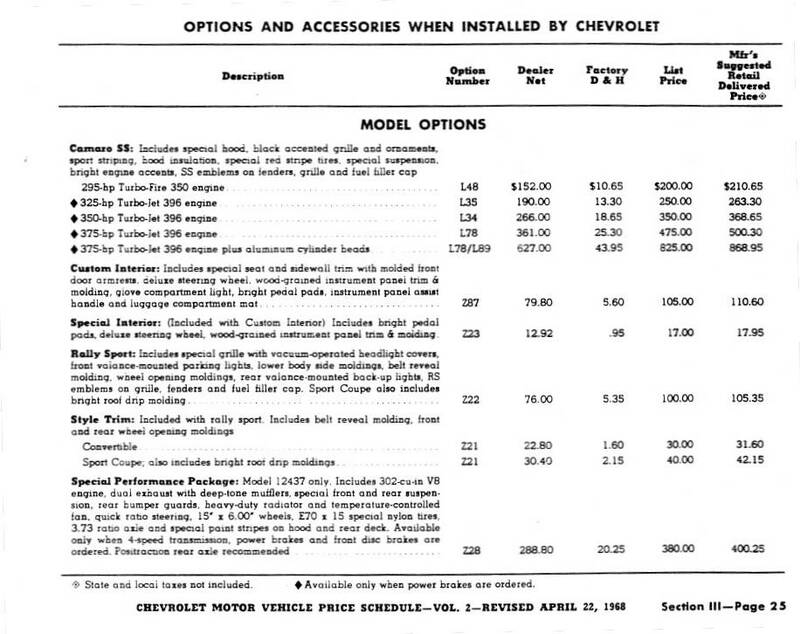 That changed when power brakes were required on SS396 models per the April 1968 ordering information. It is unknown when the factory actually required J50 with SS396 cars - some dealer documents suggest the change happened as early as January 1968. For Z28, RPO J52 power front disc brakes were a mandatory option. Manual drum brakes on all four wheels remained standard for base models, and RPO J50 power assist remained a separate option for drum brakes. RPO J52 power front disc brakes were now included in all SS models, and this RPO remained a mandatory option for Z28. The disc brakes in 1969 were redesigned to a single-piston caliper that replaced the more complicated and costly 4-piston design. To support the Z28 in Trans Am racing, a four-wheel disc brake system was released in March of 1968 as over-the-counter (OTC) heavy-duty service parts. The system was adapted from the Corvette J56 heavy-duty brake package and included larger front and rear rotors (11 3/4" vs 11" for the production J52 rotor) and 4-piston brake calipers. Though included in the 1968 assembly manual and in the POP option field information, JL8 was not a 1968 production option. The inclusion in the 1968 documentation apparently was either in preparation for a proposed option release that never occurred, or as part of a subterfuge for convincing racing authorities that the 4WD brakes were a factory option and thus qualified for Trans Am racing use. A modified version of the OTC system was released in 1969 for production as RPO JL8, 4-Wheel Power Disc Brakes. 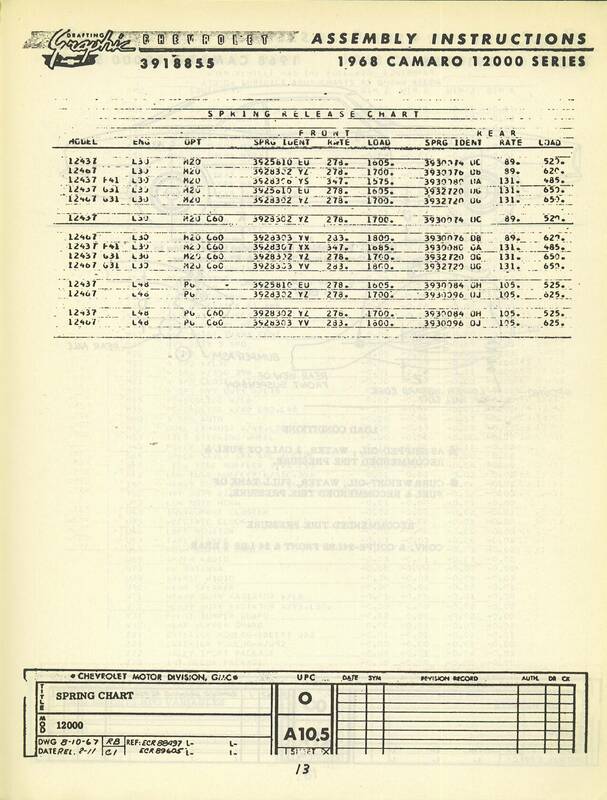 The option was only produced during a limited timeframe, from Feb 69 to May 69, and production was only 206 units. The JL8 option was available on any Camaro model; the cost was $500.30 for SS or Z28 models and $623.50 for non-SS non-Z28 models. All JL8 cars received the 15x7 rally wheels. Most JL8's were installed on Z28's, though some non-Z28 non-SS Camaros have been verified as receiving JL8! Many of the disc-brake rear axles that survive are the HD service units, rather than JL8. There are easily identifiable physical differences between the JL8 and the service axles. The most notable is the factory-installed axle tube is tapered at the brake flange mounting plate, while the service axle has a larger diameter tube with no taper. See Wayne Guinn's book, Camaro Untold Secrets 1967-1969, for details on other differences. Note: Disc brakes required special wheels with a different centerline-to-attach-plane offset. See the wheels information for the relationship between brakes and wheels. 1967-69 Camaros used Delco Moraine brake boosters. The application code for the booster is stamped on a tab on the top right of the booster (see picture below) and the Julian date is stamped on the other side of the tab. 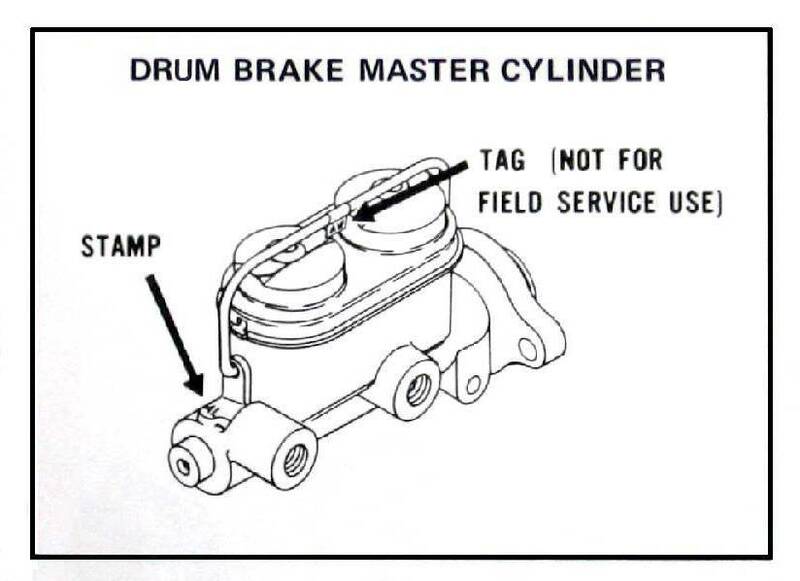 During the 1968 model year, both the drum and disc brake boosters changed to new part numbers and both codes are listed below. The 68 disc brake booster changed mid-November of 67. The drum brake booster change occurred in December or January timeframe. 1967-69 Camaros used Delco Moraine master cylinders. 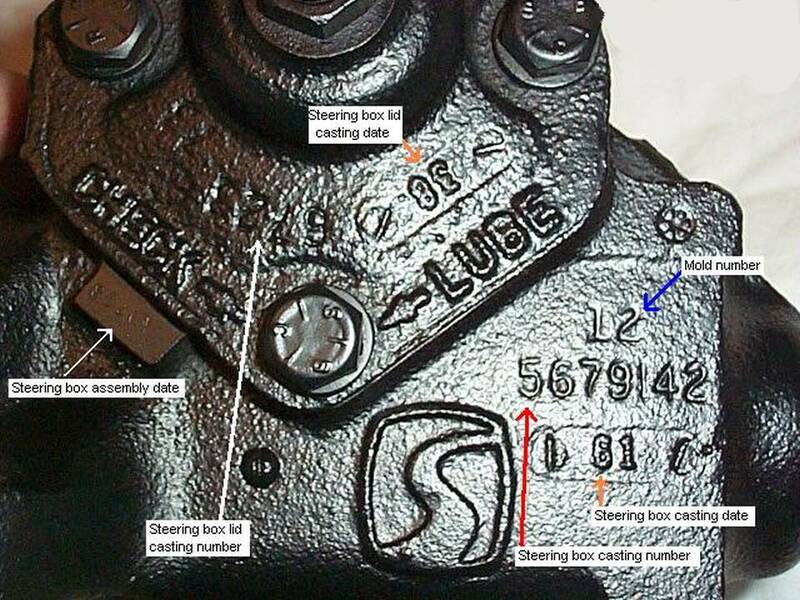 The casting number is on the the side or the bottom of the master cylinder. 67-69 manual drum brake cars used the 5452310 casting except 1967 cars with manual J65 drum brakes used the 5461862 casting. Power drum brake cars used the 5460465 casting. 1967 manual disc brake cars used the 5459467 master cylinder casting. 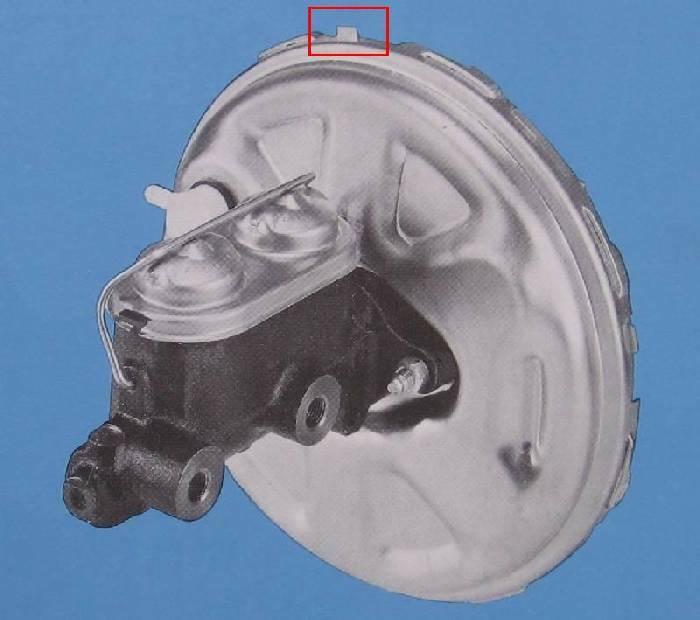 1967 and 1968 power disc brake cars used the 5460346 master cylinder. 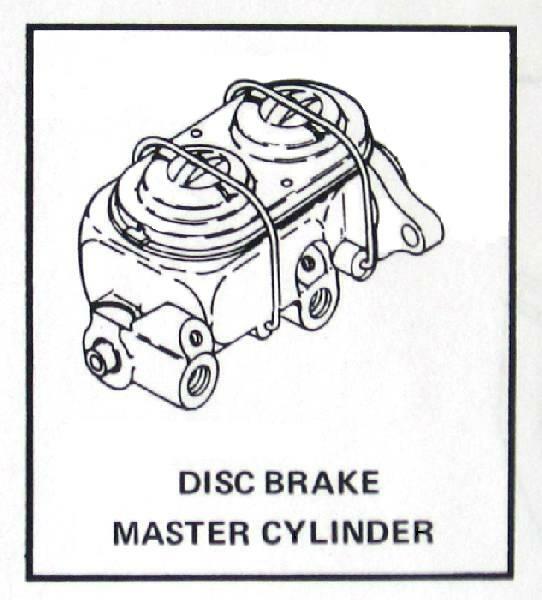 Early 1969 disc brake cars also used the 5460346 master cylinder (for about a month or so of production) with later 69 cars using the 5468309 casting. Power drum and power disc brake master cylinders were installed at an angle and trapped air in the bores of the master cylinder. Bleeder valves were installed to allow this air to be purged from the system. The manual disc brake master cylinders were installed horizontally and did not have bleeder valves. We believe the manual drum master cylinders also did not have bleeders, but there is some conflicting data and this is still being researched. 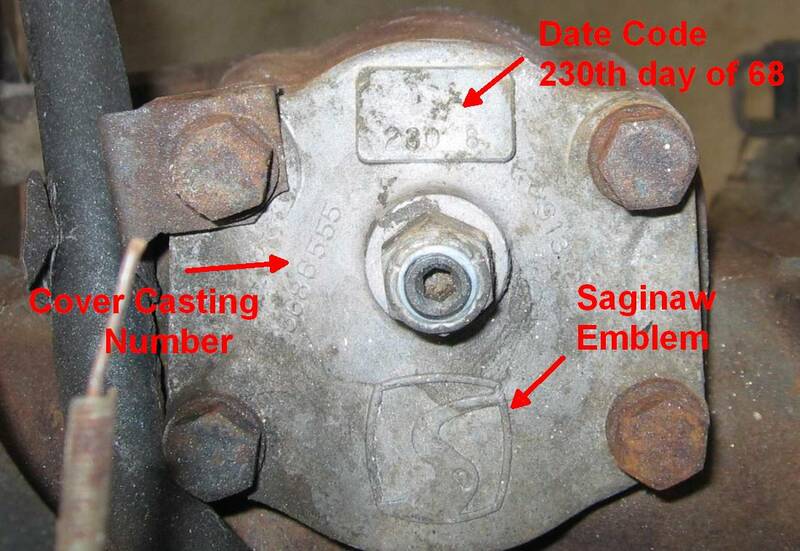 The application code for the master cylinder was stamped on a small pad on the front of the casting, as shown in the sketch below. Note the tag with the broadcast code also shown in the sketch. The broadcast code and the master cylinder application code are not the same; the broadcast code is for the entire assembly and the application code is for the bare master cylinder. 1969 J52 disc brake systems and JL8 four wheel disc brake systems used the same master cylinders. The only difference between the master cylinders was the J52 master cylinder had a residual pressure valve (aka check valve) in the outlet for the rear drum brakes, whereas the JL8 master cylinder did not have any check valves. Manual drums *    BS/CT    BS     BS     1"
Power drums *       BS     BS   BS/CT    1"
Manual J65 drums    AU     -      -     7/8"
Power J65 drums     BS     -      -      1"
Manual discs        AD     -      -      1"
Power discs         WT     WT     US   1 1/8"
JL8 4-wheel discs   -      -      US   1 1/8"
* GM documentation indicates drum brake master cylinders are BS code. And most drum brake master cylinders are coded BS. But a limited number have been observed with the CT code, in both manual and power drum applications. It is unknown why the CT part was used (possibly a substitute during a parts shortage?) and if there are any differences between the BS and CT master cylinders. The CT code is shown in the applications observed so far. Although we continue to research the usage of this valve, this is a summary of what we know so far. On certain Camaro models, a two-piece rear brake line with a brake pressure regulator valve was utilized. This valve mounts on the rear of the front subframe under the driver's door. 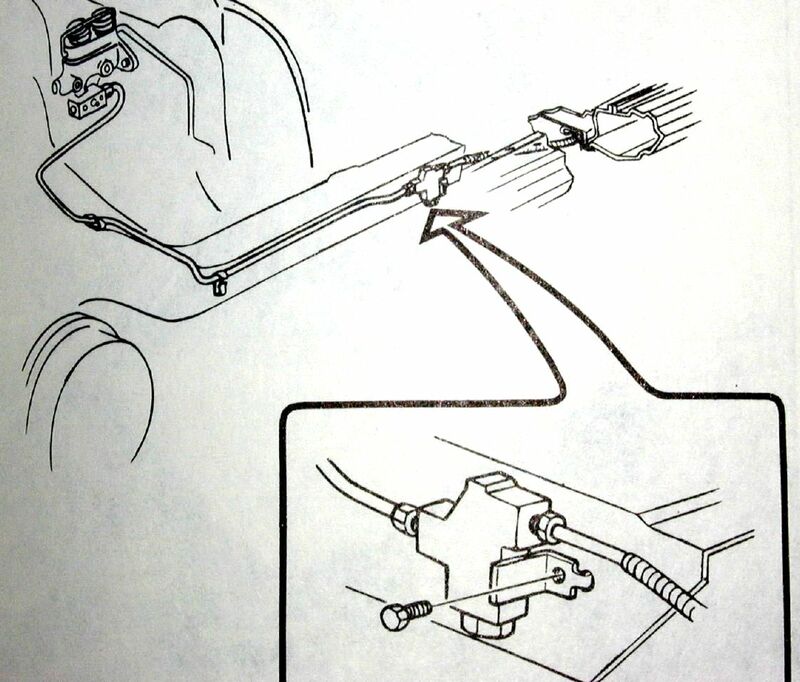 On Camaro models equipped with air conditioning, the rear brake hydraulic line is routed through a pressure regulator valve mounted on the left frame side rail (fig 3). The valve controls the hydraulic pressure to the rear brakes resulting in the correct pressure balance between the front and rear hydraulic systems. The valve limits the amount of hydraulic pressure, at a controlled rate, to the rear wheels in proportion to the amount of pressure to the front wheels. ... This action prevents the rear brakes from locking up before the full effective braking effort is produced by the front disc brakes. 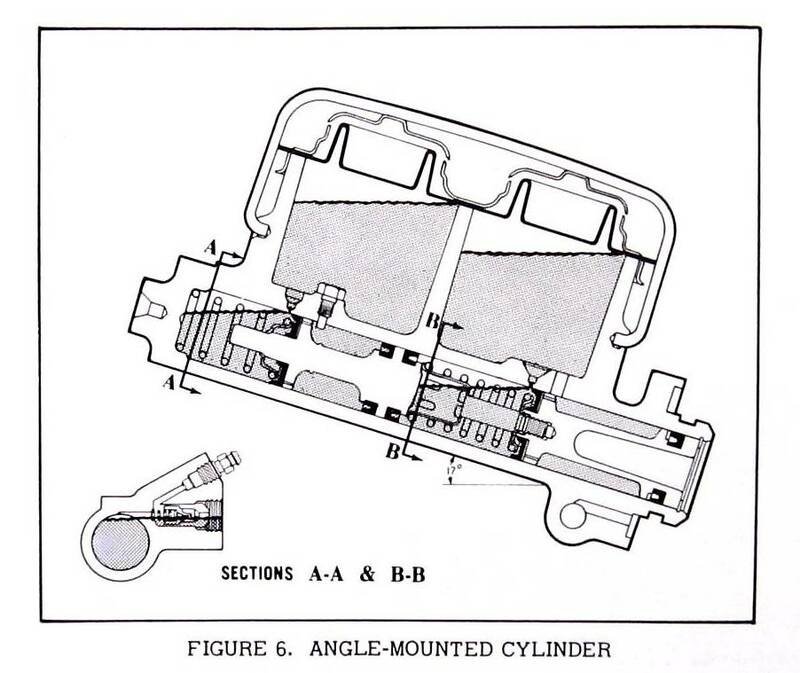 The implicit rationalization in the 1967 description was that the valve was needed to improve stopping due to higher front end weight resulting from the C60 air conditioning equipment. Restricting use to C60 is suspect logic; there were other options that added the same (or greater) front end weight. For example, in 1967, an otherwise optionless L6 with C60 would get it, while a RS/SS350 with smog, power brakes, and power steering (but no C60) would not get the valve, despite having a higher front-end weight. Usage of the valve was not consistent. 1967 Camaros that received the valve were: all models with C60 air conditioning, all SS396 models, and NOR Z28's built after March. 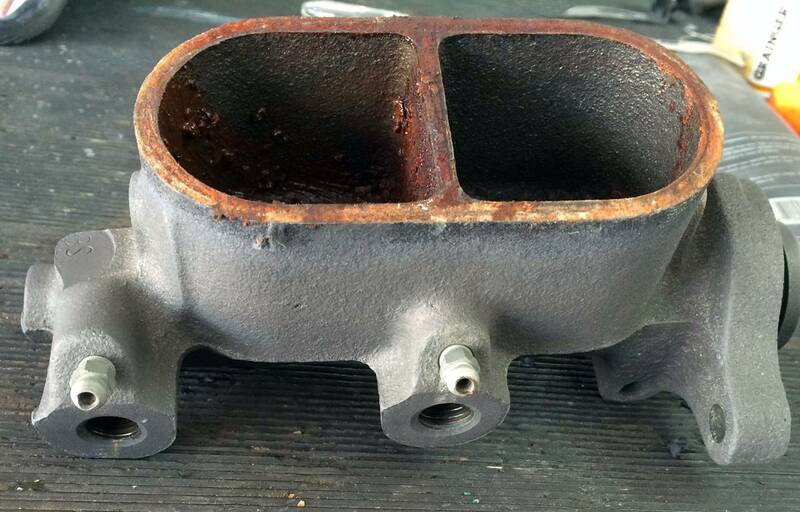 However, the 1967 LOS Z28's and early NOR Z28's did not receive the valve. For 1968, only cars with 12-bolt axles received the valve. The C60 air conditioning option no longer caused use of the valve (though C60 cars could get the valve due to a 12-bolt axle). The one known exception is that NOR Z28's stopped using the valve midway through the 68 model and didn't begin again until mid-model year 1969. For 69, the valve was generally used on 12-bolt axle applications, except for JL8 equipped cars (which had disc brakes in the rear and didn't need the valve). As noted above, the 69 NOR Z28's did not use it until mid-year, in the late January / early February timeframe. Other exceptions in 69 include: some SS's and LM1's have been observed without the valve, and the valve has been observed on some drum brake 10-bolt axle cars. Note that usage of the valve on 67-69 Camaros was not apparently related to J52 disc brakes. Opinions differ on whether the valve was effective at reducing stopping distance, but CRG has not seen any comparison braking data. If it was effective, why wasn't it used on all models, and why was the Z28 usage irregular? Information on all the different brake valves used on early Camaros is shown in Camaro brake valves article. The manual and power steering gearbox castings used on Camaros were also used for many years on other GM vehicles. The main manual gearbox used on Camaros was casting number 5679142 with 3 mounting ears. An alternate box 5696084 with 4 mounting ears was sometimes used. The power steering box was casting 5691676. Many different gearsets for many different applications were installed in those castings. There are no permanent markings on the gearbox to identify the original usage of a box. The date will be cast into the side of the box. The assembly date on manual boxes is stamped on a pad next to the cover. The format is a letter (presumed to be the shift), the Julian day , and the year: (A or B)dddy. For example, A1308 indicates the 130th day of 1968. On power steering boxes, the assembly date is stamped on the aluminum cover. The format is the Julian day and the year: ddd y. For example, 343 7 is the 343rd day of 1967. 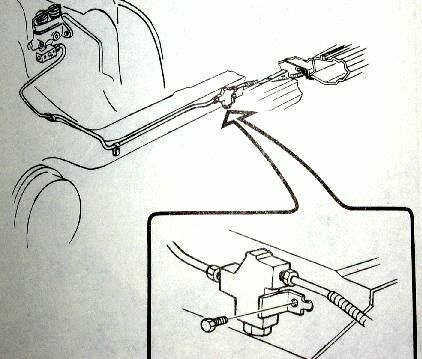 The pitman arms for manual steering and power steering use the same forging, but the splined holes for the attachment to the steering box are different diameters. 67 and 68 manual steering boxes used a cast iron cover. All 67 and 68 Camaros with V8's (both small block and big block) used the same power steering pump assembly. The long pitman arm, 3908391, 5.8" long, was used in the 67 Camaros. The 3908385 idler arm, 5.8" long, was used on 67 Camaros. The 3908391 long pitman arm was used in 68 Z28's. Other 68 Camaros used the 3935075, 5.25" long, pitman arm (both manual and power steering). The idler arm for 68 was 3917581, 5.25" long. 69 manual steering boxes used an aluminum cover. Most 69's used the same manual steering gear. Changes to the steering linkage were used to change the overall steering ratio. - Regular cars were equipped with a shorter 5.25" pitman arm (forging # 3953219) and longer steering arms (3954873 RH and 3954874 LH). 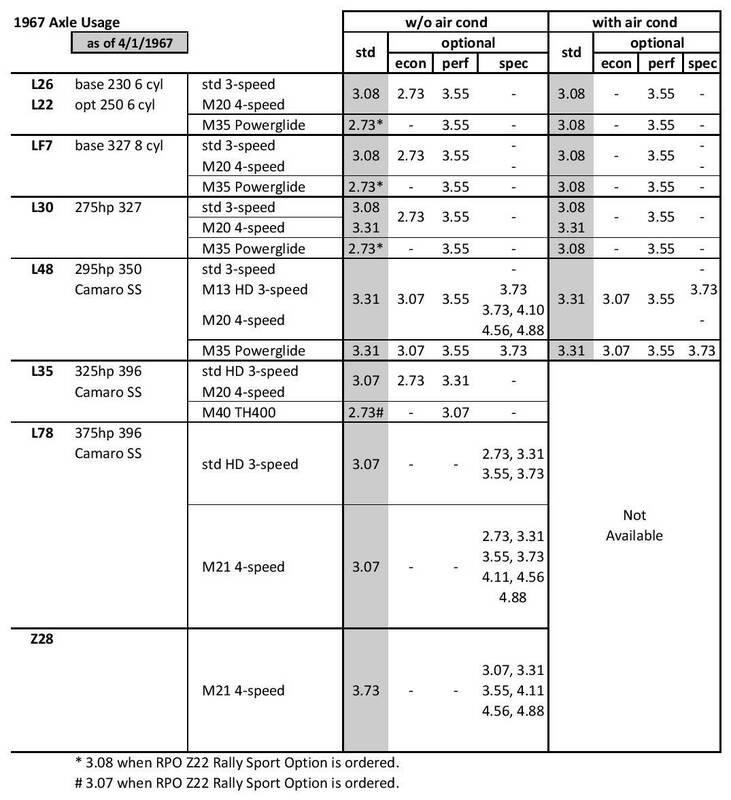 - Z28 and RPO N44 (special steering) cars utilized a longer pitman arm (forging # 3953227, 5.8" center-center) and shorter steering arms (3954875 LH and 3954876 RH). A special fast-ratio manual steering gear was used for Z28's with RPO N44. The manual Z28 with N44 used with the same longer pitman arm and shorter steering arm combination as listed above - the steering box is different. Z28's with N44 are very uncommon (and not fun to drive). All 69's used the same variable ratio power steering gearbox with approximately 2 1/3 turns lock to lock. Z28, L78, and COPO cars had a deep groove pulley on the power steering pump. - Non-Z28 and non-SS cars with power steering used a 5.25" pitman arm (forging # 3953219) and the longer steering arms (3954873 RH and 3954874 LH). - Z28, SS, and RPO N44 had a faster overall ratio by using a longer 5.8" pitman arm (forging # 3953227) combined with shorter steering arms (3954875 LH and 3954876 RH). The 69 idler arm was the same as the 68, 3917581, 5.25" long. The drag link (a.k.a. center link) for 69 power steering system is 1.125" in diameter, much larger in diameter than the .95" drag link used for manual steering. 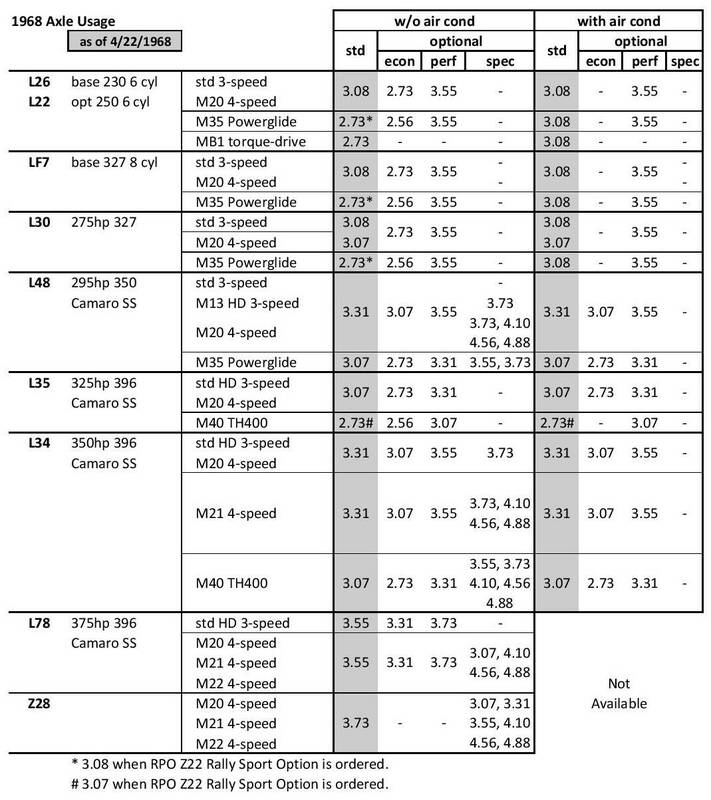 A summary of the wheel types, sizes, applications, and their relationship to brake type is presented in the table below. The application codes are normally stamped on the wheels next to the valve stem hole. Note that some early to mid-year 1967 wheels were not stamped with the application code. Most wheels are dated as shown below in the table and the picture. 67 and 68 FC coded wheels are often stamped with an alternate date format: ddmmy (day, month, year), stamped on the rim lip but not next to the valve stem. Kelsey-Hayes for Chevrolet on 8/4/69. Wheels were painted black if full disc style hubcaps were ordered on the car. If the smaller 'dogdish' style hubcaps were installed, the wheels were painted body color. Rally wheels were painted 'argent silver'. All wheels were painted with enamel paint. For 1967, rally wheels were required when disc brakes were ordered. This restriction was removed in 1968 (despite some 1968 dealer literature that indicates that disc brakes were required with rally wheels). Which means that in 1968-69, disc brake cars came with plain steel wheels, unless the ZJ7 rally wheel option was added (except for Z28 which included rally wheels). While a promotional photo exists of a 69 Z28 with the narrower 68 15x6 DF wheels, this wheel was not used on 1969 Z28's in production. The initial 69 Z28 wheel was coded AD. The YH wheel was produced starting mid-December 68 and had minor modifications to increase clearance for the JL8 brake components.